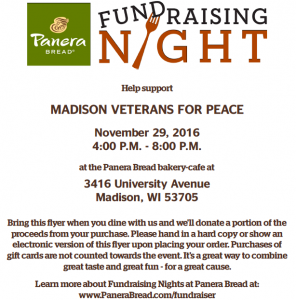 Chapter 25 fundraiser at Panera Bread, 3416 University Ave., Madison, on Tuesday, November 29 from 4-8 pm. Up to 20% of the proceeds of sales made with the attached flyer will be donated to Chapter 25. Bring the flyer for us to get proceeds of their sales. This entry was posted in Clarence Kailin Chapter 25 on November 26, 2016 by Website Administrator.